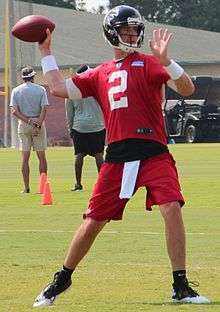 These quarterbacks have started for the National Football League's Atlanta Falcons. They are listed in order of the date of each player's first start at quarterback for the Falcons. These quarterbacks have the most starts for the Falcons in regular season games (as of Week 2 of 2016 season). ↑ "2015 Atlanta Falcons Statistics & Players". Pro Football Reference. Sports Reference LLC. Retrieved 2015-09-13. ↑ "2014 Atlanta Falcons Statistics & Players". Pro Football Reference. Sports Reference LLC. Retrieved 2015-01-01. ↑ "2012 Atlanta Falcons Statistics & Players". Pro Football Reference. Sports Reference LLC. Retrieved 2012-09-09. ↑ "2011 Atlanta Falcons Statistics & Players". Pro Football Reference. Sports Reference LLC. Retrieved 2011-09-11. ↑ "2010 Atlanta Falcons Statistics & Players". Pro Football Reference. Sports Reference LLC. Retrieved 2011-07-27. ↑ "2009 Atlanta Falcons Statistics & Players". Pro Football Reference. Sports Reference LLC. Retrieved 2011-07-27. ↑ "2008 Atlanta Falcons Statistics & Players". Pro Football Reference. Sports Reference LLC. Retrieved 2011-07-27. 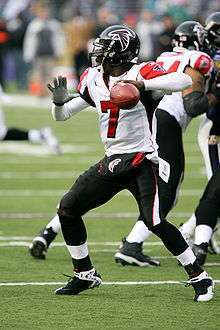 ↑ "2007 Atlanta Falcons Statistics & Players". Pro Football Reference. Sports Reference LLC. Retrieved 2011-07-27. ↑ "2006 Atlanta Falcons Statistics & Players". Pro Football Reference. Sports Reference LLC. Retrieved 2011-07-27. ↑ "2005 Atlanta Falcons Statistics & Players". Pro Football Reference. Sports Reference LLC. Retrieved 2011-07-27. ↑ "2004 Atlanta Falcons Statistics & Players". Pro Football Reference. Sports Reference LLC. Retrieved 2011-07-27. ↑ "2003 Atlanta Falcons Statistics & Players". Pro Football Reference. Sports Reference LLC. Retrieved 2011-07-27. ↑ "2002 Atlanta Falcons Statistics & Players". Pro Football Reference. Sports Reference LLC. Retrieved 2011-07-27. ↑ "2001 Atlanta Falcons Statistics & Players". Pro Football Reference. Sports Reference LLC. Retrieved 2011-07-27. ↑ "2000 Atlanta Falcons Statistics & Players". Pro Football Reference. Sports Reference LLC. Retrieved 2011-07-27. ↑ "1999 Atlanta Falcons Statistics & Players". Pro Football Reference. Sports Reference LLC. Retrieved 2011-07-27. ↑ "1998 Atlanta Falcons Statistics & Players". Pro Football Reference. Sports Reference LLC. Retrieved 2011-07-27. ↑ "1997 Atlanta Falcons Statistics & Players". Pro Football Reference. Sports Reference LLC. Retrieved 2011-07-27. ↑ "1996 Atlanta Falcons Statistics & Players". Pro Football Reference. Sports Reference LLC. Retrieved 2011-07-27. ↑ "1995 Atlanta Falcons Statistics & Players". Pro Football Reference. Sports Reference LLC. Retrieved 2011-07-27. ↑ "1994 Atlanta Falcons Statistics & Players". Pro Football Reference. Sports Reference LLC. Retrieved 2011-07-27. ↑ "1993 Atlanta Falcons Statistics & Players". Pro Football Reference. Sports Reference LLC. Retrieved 2011-07-27. ↑ "1992 Atlanta Falcons Statistics & Players". Pro Football Reference. Sports Reference LLC. Retrieved 2011-07-27. ↑ "1991 Atlanta Falcons Statistics & Players". Pro Football Reference. Sports Reference LLC. Retrieved 2011-07-27. ↑ "1990 Atlanta Falcons Statistics & Players". Pro Football Reference. Sports Reference LLC. Retrieved 2011-07-27. ↑ "1989 Atlanta Falcons Statistics & Players". Pro Football Reference. Sports Reference LLC. Retrieved 2011-07-27. ↑ "1988 Atlanta Falcons Statistics & Players". Pro Football Reference. Sports Reference LLC. Retrieved 2011-07-27. ↑ "1987 Atlanta Falcons Statistics & Players". Pro Football Reference. Sports Reference LLC. Retrieved 2011-07-27. ↑ "1986 Atlanta Falcons Statistics & Players". Pro Football Reference. Sports Reference LLC. Retrieved 2011-07-27. ↑ "1985 Atlanta Falcons Statistics & Players". Pro Football Reference. Sports Reference LLC. Retrieved 2011-07-27. ↑ "1984 Atlanta Falcons Statistics & Players". Pro Football Reference. Sports Reference LLC. Retrieved 2011-07-27. ↑ "1983 Atlanta Falcons Statistics & Players". Pro Football Reference. Sports Reference LLC. Retrieved 2011-07-27. ↑ "1982 Atlanta Falcons Statistics & Players". Pro Football Reference. Sports Reference LLC. Retrieved 2011-07-27. ↑ "1981 Atlanta Falcons Statistics & Players". Pro Football Reference. Sports Reference LLC. Retrieved 2011-07-27. ↑ "1980 Atlanta Falcons Statistics & Players". Pro Football Reference. Sports Reference LLC. Retrieved 2011-07-27. ↑ "1979 Atlanta Falcons Statistics & Players". Pro Football Reference. Sports Reference LLC. Retrieved 2011-07-27. ↑ "1978 Atlanta Falcons Statistics & Players". Pro Football Reference. Sports Reference LLC. Retrieved 2011-07-27. ↑ "1977 Atlanta Falcons Statistics & Players". Pro Football Reference. Sports Reference LLC. Retrieved 2011-07-27. ↑ "1976 Atlanta Falcons Statistics & Players". Pro Football Reference. Sports Reference LLC. Retrieved 2011-07-27. ↑ "1975 Atlanta Falcons Statistics & Players". Pro Football Reference. Sports Reference LLC. Retrieved 2011-07-27. ↑ "1974 Atlanta Falcons Statistics & Players". Pro Football Reference. Sports Reference LLC. Retrieved 2011-07-27. ↑ "1973 Atlanta Falcons Statistics & Players". Pro Football Reference. Sports Reference LLC. Retrieved 2011-07-27. ↑ "1972 Atlanta Falcons Statistics & Players". Pro Football Reference. Sports Reference LLC. Retrieved 2011-07-27. ↑ "1971 Atlanta Falcons Statistics & Players". Pro Football Reference. Sports Reference LLC. Retrieved 2011-07-27. ↑ "1970 Atlanta Falcons Statistics & Players". Pro Football Reference. Sports Reference LLC. Retrieved 2011-07-27. ↑ "1969 Atlanta Falcons Statistics & Players". Pro Football Reference. Sports Reference LLC. Retrieved 2011-07-27. ↑ "1968 Atlanta Falcons Statistics & Players". Pro Football Reference. Sports Reference LLC. Retrieved 2011-07-27. ↑ "1967 Atlanta Falcons Statistics & Players". Pro Football Reference. Sports Reference LLC. Retrieved 2011-07-27. ↑ "1966 Atlanta Falcons Statistics & Players". Pro Football Reference. Sports Reference LLC. Retrieved 2011-07-27. 1 2 3 4 Matt Ryan. Pro-Football-Reference.com. Sports Reference. Retrieved 21 January 2013. 1 2 Michael Vick. Pro-Football-Reference.com. Sports Reference. Retrieved 26 July 2011. ↑ Chris Chandler. Pro-Football-Reference.com. Sports Reference. Retrieved 26 July 2011. ↑ Jeff George. Pro-Football-Reference.com. Sports Reference. Retrieved 26 July 2011. ↑ Chris Miller. Pro-Football-Reference.com. Sports Reference. Retrieved 26 July 2011. 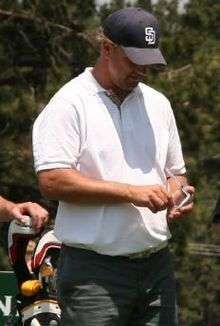 1 2 3 Steve Bartkowski. Pro-Football-Reference.com. Sports Reference. Retrieved 26 July 2011. "Usual Starting Line-ups". Atlanta Falcons Official Web Site. Archived from the original on 2007-04-10. Retrieved 2007-05-20. "Falcons All-time Starting Quarterbacks". Atlanta Falcons Official Web Site. Archived from the original on 2007-04-10. Retrieved 2007-05-20. "Atlanta Falcons Franchise Encyclopedia". Pro Football Reference. Sports Reference LLC. Retrieved 2011-05-07.